The Australian 15-man squad is named on Sunday January 11 - so here is the Australians www.wdnicolson.com has picked to win the World Cup on home soil. We'll start with our squad and name the 11 we'd take into each game to try and win this thing. Let's win a World Cup for the first time AT HOME! I want to find room for Bailey at #6 but it is hard to push the likes of Marsh, Haddin, Faulkner and Johnson down another rung. If Bailey does get a run - Marsh misses out in all likelihood if the selectors decide Starc has to play or they want Maxwell's spin - my choice is Boyce because we need a genuine turner of the ball who can push for wickets vs keeping the runs down. He's not perfect by any means but I desperately want a spinner because if the wickets take spin (it is a relatively big IF but you have to cover it) I want an actual spinner - and that's not Glenn Maxwell (but yes - he makes my squad because you might actually use him vs Shaun Marsh or ). The batting picks itself - the openers are locked in stone and I'd play Clarke at 3 so he gets maximum batting time - ditto for Smith. That pushes Watson to 5 where I think he's better suited to in ODI cricket anyway, Marsh or Bailey at 6 = very happy with that for a top/middle order. Haddin gets the job behind the stumps and I'd pick Tim Paine as my backup (Update: now has a broken big toe so he's out) because he can bat like a batsman if he has to and Haddin may benefit from a breather in the prelim stages and I just like having a squad member as the backup vs a converted batsmen who hasn't kept. He narrowly gets the call ahead of the guy who has impressed me massively this Big Bash in Tim Ludeman - the guy hits the ball as cleanly as anyone and plays smart shots to good areas of the ground rather than just launching wily nily. Harris is just too good a player to leave out for a young bowler - this is a World Cup not a ODI series in preparation for a World Cup - you pick your best players. Johnson is a weapon and clearly beats out Starc as our left armer and Faulkner, Marsh, Boyce and Watson bowl 30 overs between them. Just quietly - I love that attack. So there's no Pat Cummins (may make it though and probably gets my open spot vacated by Paine), Josh Hazlewood (he's gassed after 3 Tests in a row - not for me), Justin Behrendorff (one too many left handers sorry kid), Nathan Coulter-Nile or James Pattinson (if fit I'd have considered the last two) and I just think picking Brad Hogg wouldn't be the right choice... a T20 World Cup - yes I'd pick him, but not if you want him bowling 10 overs... mind you, I wouldn't complain if he got the 15th spot - as I think there isn't a standout choice otherwise. I also don't think we need another batsmen - for mine if we lose one of those we've picked - we can find a batsmen in an injury swap easy enough - same goes for the bowlers. So there's my team... I think we make the Semi Finals - but gee there's some good teams in World Cricket right now so I can't say for sure we make the Final or win the thing. But gee it's going to be good to watch. And if you are in Australia right now and haven't bought a ticket yet - why not? I'll be going to as many games in Sydney as I can and if I have to shell out $140 for the Semi Final - then yep, I'll do it. It's been 23 years since we've had a World Cup in our backyard - and it might be nearly that long again given the powerful nature of the subcontinent with hosting major tournaments - so get 2015 WORLD CUP TICKETS. 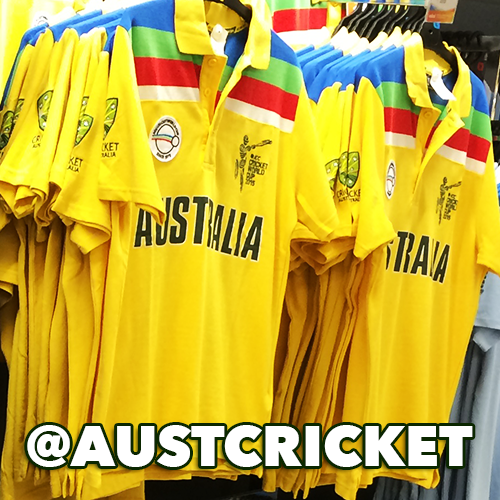 Look for semi-regular tweets on the #CWC15 via @AustCricket and @wdnicolson during the tournament.